Mice are not the sort of pests you want roaming around your home or garden. Mice can destroy property, contaminate your food and pose a dangerous health risk to your family. Even in your garden storage shed or building, mice can wreak havoc. There are several types of poison that quickly eradicate mice from homes and storage facilities. However, the poison poses a health risk to pets and small children. One of the safest ways to get rid of mice in a storage building is to use vinegar. The scent of vinegar is noxious to many four-legged pests, including mice and rats. 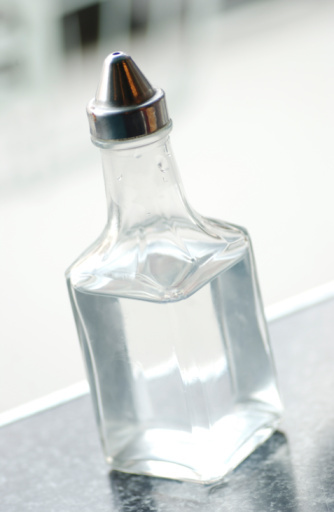 Distilled vinegar is a natural mouse repellant. Clean out the storage building to remove garbage, debris and other materials that could act as nesting materials or camouflage for a mouse. Remove bags of animal feed or pet food from the storage facility and store in airtight containers. The scent of the food is most likely what is enticing the mice to enter your storage building. Fill a large bowl with vinegar, and soak several rags in it for a few minutes. Remove the rags one by one, and squeeze out the excess vinegar. Stuff the vinegar-soaked rags in window frames, doorjambs and any other cracks or crevices where a mouse might seek refuge. Close the windows and door of the storage building to increase the scent of the vinegar within the building. Replace the rags with fresh ones if you still notice mice in and around the storage building or if you find mouse droppings in the vicinity. Heather Meehan is a published writer in Kuwait, Dubai, Canada, the U.S., the U.K and Egypt. She has been writing since 2004, and has been published in "The Muslim Observer" and "Khaleej Times." Meehan holds a Bachelor of Arts degree in criminal justice from Waynesburg College.